Green Rice, also known as Arroz Verde, is an upgraded, special-occasion version of Mexican Rice. Go ahead, try something new! Your family is going to LOVE IT. We all know what Mexican rice is: It’s the red, tomato-based rice on the side of every Mexican dish, ever. 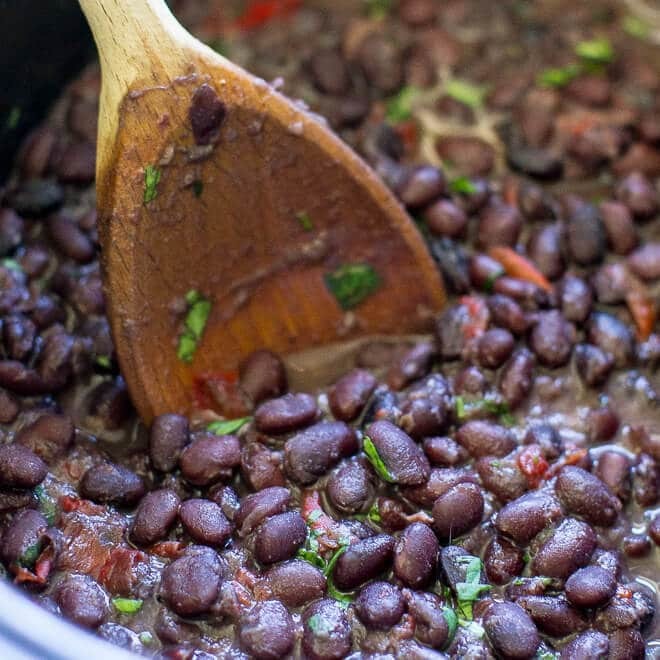 It’s often paired with refried beans, unless you skip the beans and double your rice. Green Rice is a lot like that except instead of tomatoes, it’s made with poblano peppers and cilantro. That means loads of flavor and a pretty, green-flecked appearance. That also means you’ll probably be skipping the beans and doubling your rice. Green Rice is more than a pretty face and a flavor powerhouse, though. Rice packs a serious nutritional punch. Whether you’re eating enriched white rice or whole grain brown rice, U.S.-grown rice provides more than 15 essential vitamins and minerals. It provides an affordable foundation for any meal whether you’re pairing it with lean protein, vegetables, or eating it on the side of your favorite Mexican dishes. I came across a version of Green Rice in The San Francisco Chronicle Cookbook and was immediately intrigued. After reading through, it sounded a lot like my Restaurant-Style Mexican Rice, so I basically just modified that recipe to use poblanos instead of tomatoes. 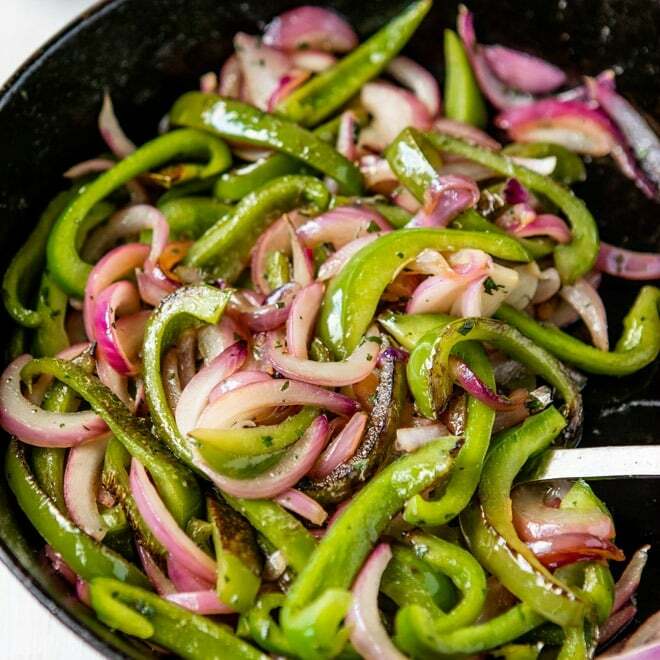 The Chronicle recipe calls for roasted poblano peppers. I get “a kick” out of things like roasting poblano peppers, but I also tested the recipe with raw poblanos. And other bloggers have made the recipe with raw poblanos. My point? You can make Green Rice with roasted poblano peppers OR with raw peppers. Either one. I prefer using a food processor for my poblano puree. It is “more fun.” Maybe I like the way the blade whirs? Who knows. 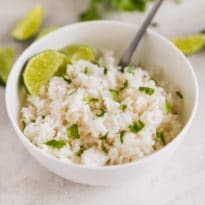 Just like my Restaurant-Style Mexican Rice, Green Rice is cooked in a small amount of oil, pilaf-style (while it’s still crunchy). This helps ensure the grains are separated and fluffy by the end. While the Chronicle recipe finishes on the stove-top, I followed the Mexican Rice method and finished my rice in the oven. Why mess with a good thing? 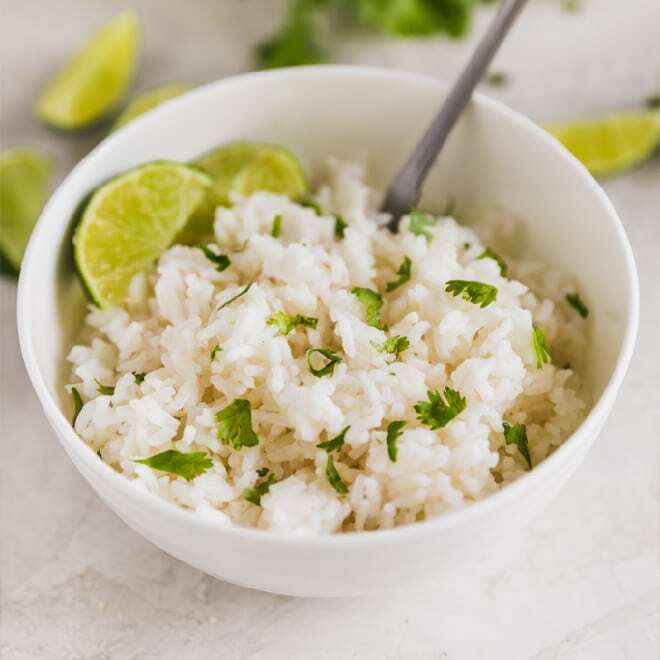 Once the rice is out of the oven, fluff it with a fork, taste for salt and pepper, and garnish with a few cilantro leaves if you want. Green Rice is great on the side of all your favorite Mexican dishes (such as these enchiladas as shown in the photos). I love it on burritos, on salads, and even plain garnished with cheese and sour cream. Look for “Grown in the USA Rice” logo on packages of 100% domestically-grown rice in grocery stores. You’l help yourself (wholesome nutrition) and the planet (fewer food miles). Save this Green Rice (Arroz Verde) to your “Side Dishes” Pinterest board! In a food processor or blender, blend the poblanos, cilantro, garlic, and water. Heat the oil in a Dutch oven or a 3-quart saucepan until shimmering (see notes). Add the rice and sauté, stirring frequently, until light golden in color, about 10 to 15 minutes. Add jalapenos (if using) and stir until fragrant, about 15 seconds. Stir in poblano puree and 1 teaspoon salt. Bring to a boil. Cover and bake (or transfer to a baking dish and cover) until the rice is tender and the liquid is absorbed, about 30 minutes. Stir halfway through baking time. Fluff rice with a fork. 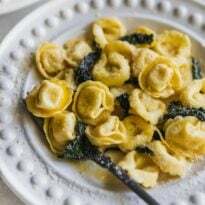 Season to taste with salt and pepper and garnish with reserved cilantro leaves if desired. Follow my easy instructions on how to roast poblano peppers. This will add about 90 minutes to your prep time (only 5-10 minutes of hand's on time) but can easily be done ahead of time. To rinse the rice, pour the dry rice into a fine-mesh sieve and rinse under running water until the water is clear. Alternatively, to conserve water, the rice may be soaked in a large bowl of cold water for 30 minutes and then drained well. If toasting the rice in a 3-quart saucepan, you'll want to transfer it to a 4-quart or larger oven-proof baking dish for baking. Inspired by The San Francisco Chronicle Cookbook. Adapted from my Restaurant-Style Mexican Rice recipe (which is adapted from The America's Test Kitchen Family Cookbook). Like the looks of those Creamy Chicken Enchiladas? Grab the recipe here. The enchiladas Suizas look delicioso tambien! Yum! Mexican food is my favorite! I have a special place in my heart for Mexican rice too. I even with went to Mexico and have never heard of arroz verde. This is so intriguing and I can’t wait to try!!! This sounds yummy, would love to try if I had enough poblano’s?. I love Mexican food, was my craving when pregnant. Of course, my daughter loves Mexican food too. It is just hard to find good Mexican vegetables here. One time in 8 years they brought in tomatillo’s and I got so excited and bought a big bag of them. Pregnancy cravings are so funny! I actually hate most food when I’m pregnant, except for salads with hot bacon dressing… go figure! I can imagine if you saw a good ingredient like that, the instinct would be to stock up. I’m so glad you found my blog. And even if you can’t quite make this rice, I appreciate you commenting. :) Maybe your poblano seeds will flourish!! Crossing my fingers for you! Growing up we had white or yellow rice. This takes rice up a notch or two. It is going on my list of must try recipes. Thank you so much, Celeste! I’m assuming it was saffron that made the yellow rice yellow. Some day I might have to just make all the colors of rice and call it a Rainbow Rice Bowl. ? I’ve never tried the green rice. Looks great! I’ll add it to my Mexican repertoire! This sounds like a nice change to regular rice. I noticed that you didn’t put the amount of water required for the recipe. I did reference the Restaurant Style recipe you have posted & saw you used a water/broth mix. Will be making this for dinner tonight cooking it in a 2 to 1 ratio of liquid & rice. Thank you for post such a wonderful looking dish. I am so sorry about that, Ed! Another reader just kindly emailed me and point out my error. It is supposed to be 2 cups of water (or chicken broth also works). It was incredibly resourceful of you to look at the other rice recipe but normally you shouldn’t have to do any sleuthing. :) I’m fixing the recipe right now. Sorry about that and thanks for putting up with me!! It turned out fantastic! I grilled the peppers (including the jalapeno) & whizzed it all together.) Served the rice with an Asian-style marinated flank steak. One bite & the wife said ” we’re having this again”! Thank you & I enjoy your site. That sounds SO GOOD, Ed! I could go for some flank steak. Great idea. I appreciate your kind words, too. :) Take care! Hey there! You know, Google has all the answers. There are so many variables to stuff like this. You can start on a free platform, but if you stick with it you’ll just end up switching later. So if you want to do it, commit to doing it for at least a year, and if you can find a cheap host (Bluehost is usually pretty affordable and fine when you’re just starting out), you’ll save time in the long run. But definitely just start and you can figure everything out along the way! :) Best of luck to you! Blogging is awesome and fun and I hope you give it a try. this is the best rice I have ever made. We have poblanos frozen from our garden. Incredible flavor and the rice is perfect, light and fluffy. I have made this three times now and my family loves it. Thank you, no more mushy rice dishes thanks to you, perfect every time.